Coca-Cola Europe is promoting Burn, the energy drink, with an integrated advertising campaign centred around short films “Ride”, “Playground” and “Peepshow”. The series tells the stories of real-life characters from the skate, music, and snowboarding communities. The films have be activated online with strategic seeding in over 65 community channels and will feature in Burn-branded social media spaces and an online hub. The work will be rolled out in 43 European markets starting 22 July with a hub at www.burn.com. The integrated programme will also feature filmed content created in grassroots, cross-community projects designed by Mojo and activated by Coca-Cola’s local European markets. 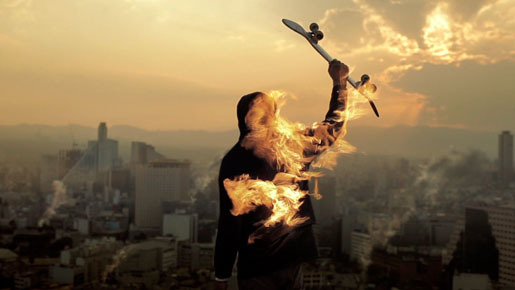 The Garth Davis-directed ‘Ride’, shot in Mexico City, is a piece whose gritty reality is heightened by flaming trails that the skaters leave in their wake, a metaphor for their fierce creative expression. The riders, who were literally on fire, were coordinated by LA-based skate guru Steve Berra, who hosts the most influential online blog in the skating community. See the Coke Burn Ride Facebook page. ‘Playground’ and ‘Peepshow’ are pure lyrical documentary, shot in urban Philadelphia and Quebec City respectively. The Burn campaign was developed at Publicis Mojo, Sydney, by chief creative officer Craig Davis, executive creative director Micah Walker, creatives Ian Williamson, Andrew Ostrom, Ruth Bellotti, Kirsty Gavin, producers Pip Smart, Corey Esse, Ali Dunlop and Lisa Vermaak, strategists Graham Ritchie, Simone Ellis, Will Davie, and account manager Simon Ludowyke. See the Mojo Things brand site associated with the Coke Burn campaign. Filming for Ride was shot by director Garth Davis via Exit Films, Melbourne, with producer Karen Sproul, director of photography Greig Fraser, editor Jack Hutchings, The Butchery, and VFX artist Colin Renshaw, Cutting Edge. Filming for Peepshow was shot by director/DOP Jonathan Hill via Exit Films, with producer Allison Lockwood, executive producers Garth Davis and Karen Sproul, and editor Rohan Zerna at The Butchery. Filming for Playground was shot by director/DOP Glendyn Ivin via Exit Films with producer Allison Lockwood, executive producers Garth Davis and Karen Sproul, and editor Peter Scriberras at The Butchery. Music was supervised by Karl Richter at Level 2 Music. Sound was mixed by Jason Murphy at GAS. The digital campaign was developed at The Rumpus Room, London, by creative lead Tomas Roope, production lead Steve Wyles, technical lead Kentaro Yamada, social media strategist Jessica MacCormick. Stills were by photographer Ben Stockley with retoucher Innes Robins at Electric Art.